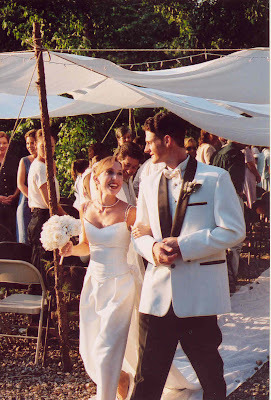 On this day, 14 years ago, Jason and I both said, "I do." It was not a lavish affair. But we did it our way. We catered it for 78 people - sit down meal with salad, homemade manicotti (which I haven't made since), and of course cake for dessert, which I also decorated. 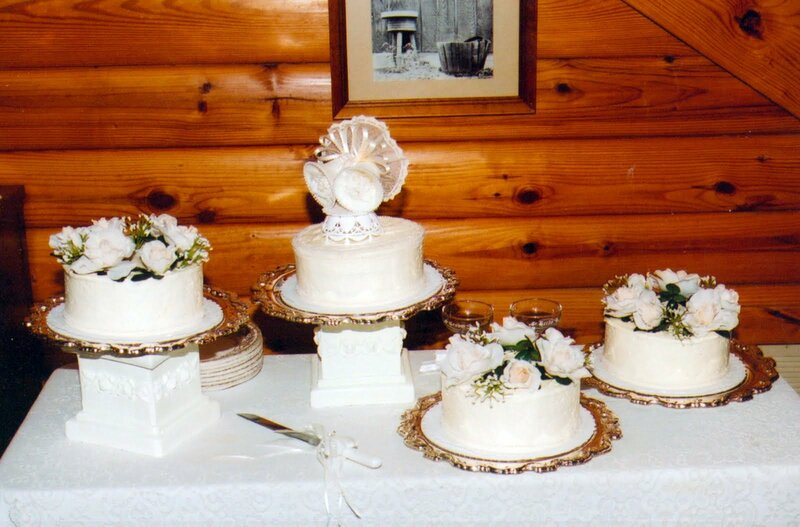 I picked up my favorite cake, an Italian Cream cake from a local bakery for $13 each and adorned them with lace, pearls and white roses (hard to see the details). My mother custom made my dress and even made all of the flower arrangements, all white silk roses which I later took to the grave of a dear friend who would have and should have been there. 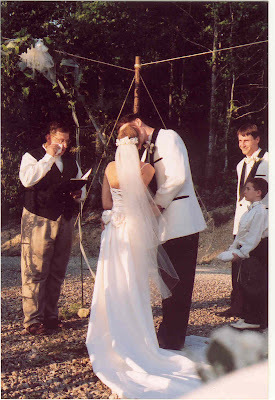 My cousin officiated the ceremony on my mother's property on a hot summer evening. It was just over 100 degrees that day (but the hottest day of the year came after we were on our honeymoon at least). We giggled during the vows. I even temporarily lost my wedding ring after we walked back down the aisle. We were worry-free. Again, not lavish, but just right with family and friends and of course each other. Marriage is never easy, but neither is life. We've had ups and downs and we've stood by each other through it all. I am blessed. We're celebrating this year with a trip to Boston. I'll see you all when we return!